Missing values are considered to be the first obstacle in predictive modeling. Hence, it’s important to master the methods to overcome them. Though, some machine learning algorithms claim to treat them intrinsically, but who knows how good it happens inside the ‘black box’. The choice of method to impute missing values, largely influences the model’s predictive ability. In most statistical analysis methods, listwise deletion is the default method used to impute missing values. But, it not as good since it leads to information loss. 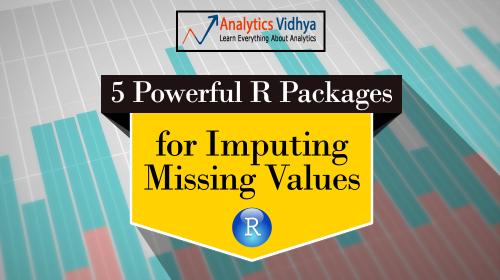 Do you know R has robust packages for missing value imputations? Yes! R Users have something to cheer about. We are endowed with some incredible R packages for missing values imputation. These packages arrive with some inbuilt functions and a simple syntax to impute missing data at once. Some packages are known best working with continuous variables and others for categorical. With this article, you can make a better decision choose the best suited package. In this article, I’ve listed 5 R packages popularly known for missing value imputation. There might be more packages. But, I decided to focus on these ones. I’ve tried to explain the concepts in simplistic manner with practice examples in R.
MICE (Multivariate Imputation via Chained Equations) is one of the commonly used package by R users. Creating multiple imputations as compared to a single imputation (such as mean) takes care of uncertainty in missing values. MICE assumes that the missing data are Missing at Random (MAR), which means that the probability that a value is missing depends only on observed value and can be predicted using them. It imputes data on a variable by variable basis by specifying an imputation model per variable. For example: Suppose we have X1, X2….Xk variables. If X1 has missing values, then it will be regressed on other variables X2 to Xk. The missing values in X1 will be then replaced by predictive values obtained. Similarly, if X2 has missing values, then X1, X3 to Xk variables will be used in prediction model as independent variables. Later, missing values will be replaced with predicted values. By default, linear regression is used to predict continuous missing values. Logistic regression is used for categorical missing values. Once this cycle is complete, multiple data sets are generated. These data sets differ only in imputed missing values. Generally, it’s considered to be a good practice to build models on these data sets separately and combining their results. Let’s understand it practically now. Since, MICE assumes missing at random values. Let’s seed missing values in our data set using prodNA function. You can access this function by installing missForest package. I’ve removed categorical variable. Let’s here focus on continuous values. To treat categorical variable, simply encode the levels and follow the procedure below. mice package has a function known as md.pattern(). It returns a tabular form of missing value present in each variable in a data set. Let’s understand this table. There are 98 observations with no missing values. There are 10 observations with missing values in Sepal.Length. Similarly, there are 13 missing values with Sepal.Width and so on. This looks ugly. Right ? We can also create a visual which represents missing values. It looks pretty cool too. Let’s check it out. Let’s quickly understand this. There are 67% values in the data set with no missing value. There are 10% missing values in Petal.Length, 8% missing values in Petal.Width and so on. You can also look at histogram which clearly depicts the influence of missing values in the variables. Now, let’s impute the missing values. Since there are 5 imputed data sets, you can select any using complete() function. Also, if you wish to build models on all 5 datasets, you can do it in one go using with() command. You can also combine the result from these models and obtain a consolidated output using pool() command. Please note that I’ve used the command above just for demonstration purpose. You can replace the variable values at your end and try it. 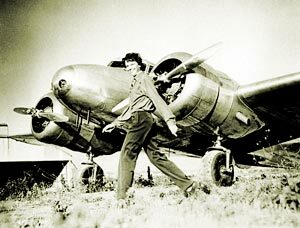 This package (Amelia II) is named after Amelia Earhart, the first female aviator to fly solo across the Atlantic Ocean. History says, she got mysteriously disappeared (missing) while flying over the pacific ocean in 1937, hence this package was named to solve missing value problems. This package also performs multiple imputation (generate imputed data sets) to deal with missing values. Multiple imputation helps to reduce bias and increase efficiency. It is enabled with bootstrap based EMB algorithm which makes it faster and robust to impute many variables including cross sectional, time series data etc. Also, it is enabled with parallel imputation feature using multicore CPUs. All variables in a data set have Multivariate Normal Distribution (MVN). It uses means and covariances to summarize data. It works this way. First, it takes m bootstrap samples and applies EMB algorithm to each sample. The m estimates of mean and variances will be different. Finally, the first set of estimates are used to impute first set of missing values using regression, then second set of estimates are used for second set and so on. MICE imputes data on variable by variable basis whereas MVN uses a joint modeling approach based on multivariate normal distribution. MICE is capable of handling different types of variables whereas the variables in MVN need to be normally distributed or transformed to approximate normality. Also, MICE can manage imputation of variables defined on a subset of data whereas MVN cannot. Hence, this package works best when data has multivariable normal distribution. If not, transformation is to be done to bring data close to normality. As the name suggests, missForest is an implementation of random forest algorithm. It’s a non parametric imputation method applicable to various variable types. So, what’s a non parametric method ? Non-parametric method does not make explicit assumptions about functional form of f (any arbitary function). Instead, it tries to estimate f such that it can be as close to the data points without seeming impractical. How does it work ? In simple words, it builds a random forest model for each variable. Then it uses the model to predict missing values in the variable with the help of observed values. It yield OOB (out of bag) imputation error estimate. Moreover, it provides high level of control on imputation process. It has options to return OOB separately (for each variable) instead of aggregating over the whole data matrix. This helps to look more closely as to how accurately the model has imputed values for each variable. NRMSE is normalized mean squared error. It is used to represent error derived from imputing continuous values. PFC (proportion of falsely classified) is used to represent error derived from imputing categorical values. This suggests that categorical variables are imputed with 6% error and continuous variables are imputed with 15% error. This can be improved by tuning the values of mtry and ntree parameter. mtry refers to the number of variables being randomly sampled at each split. ntree refers to number of trees to grow in the forest. Hmisc is a multiple purpose package useful for data analysis, high – level graphics, imputing missing values, advanced table making, model fitting & diagnostics (linear regression, logistic regression & cox regression) etc. Amidst, the wide range of functions contained in this package, it offers 2 powerful functions for imputing missing values. These are impute() and aregImpute(). Though, it also has transcan() function, but aregImpute() is better to use. impute() function simply imputes missing value using user defined statistical method (mean, max, mean). It’s default is median. On the other hand, aregImpute() allows mean imputation using additive regression, bootstrapping, and predictive mean matching. In bootstrapping, different bootstrap resamples are used for each of multiple imputations. Then, a flexible additive model (non parametric regression method) is fitted on samples taken with replacements from original data and missing values (acts as dependent variable) are predicted using non-missing values (independent variable). 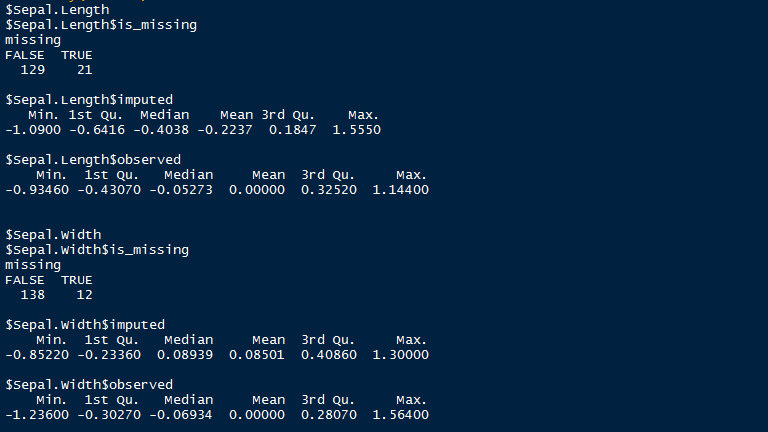 Then, it uses predictive mean matching (default) to impute missing values. Predictive mean matching works well for continuous and categorical (binary & multi-level) without the need for computing residuals and maximum likelihood fit. It assumes linearity in the variables being predicted. Fisher’s optimum scoring method is used for predicting categorical variables. argImpute() automatically identifies the variable type and treats them accordingly. mi (Multiple imputation with diagnostics) package provides several features for dealing with missing values. Like other packages, it also builds multiple imputation models to approximate missing values. And, uses predictive mean matching method. Though, I’ve already explained predictive mean matching (pmm) above, but if you haven’t understood yet, here’s a simpler version: For each observation in a variable with missing value, we find observation (from available values) with the closest predictive mean to that variable. The observed value from this “match” is then used as imputed value. It allows graphical diagnostics of imputation models and convergence of imputation process. It uses bayesian version of regression models to handle issue of separation. It automatically detects irregularities in data such as high collinearity among variables. Also, it adds noise to imputation process to solve the problem of additive constraints. Here is a snapshot o summary output by mi package after imputing missing values. As shown, it uses summary statistics to define the imputed values. So, which is the best of these 5 packages ? I am sure many of you would be asking this! Having created this tutorial, I felt Hmisc should be your first choice of missing value imputation followed by missForest and MICE. Hmisc automatically recognizes the variables types and uses bootstrap sample and predictive mean matching to impute missing values. You don’t need to separate or treat categorical variable, just like we did while using MICE package. However, missForest can outperform Hmisc if the observed variables supplied contain sufficient information. In this article, I explain using 5 different R packages for missing value imputation. Such advanced methods can help you score better accuracy in building predictive models. Did you find this article useful ? Which package do you generally use to impute missing values ? Do share your experience / suggestions in the comments section below. Hi Manish, thanks for spending your precious time in writing this nice article. I have one doubt whether transformation has to be done after or before imputing missing values. Secondly is there any method to impute outliers. In case of Amelia, if the data does not have multivariate normal distribution, transformation is required. Alternatively, you can use aregImpute() function from Hmisc package. 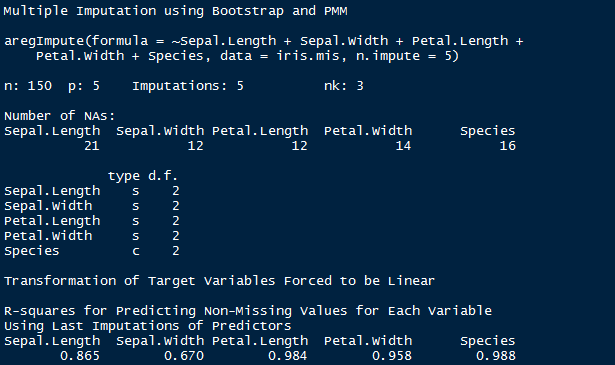 It also uses predictive mean matching, bootstrapping and addition regression methods. Thanks Manish for an excellent article. . For a feature, how much % of values if missing should be considered for imputation ? What I mean is – if a feature has values in 5-10 % of total rows – it is good to drop the feature. Please correct my understanding if I am wrong. Here I am not understanding what should be the arguments in mixError function. In the example which you have provided you have explicitly seeded missing value. However in my case newdata contains missing values. newdata.imp$ximp is the imputed dataset. What should I pass for the second argument in mixError function. great article Manish. I’ve been using some of these packages for a while but I wasn’t aware of many of the nuances you pointed out. Really useful. Very good information Manish.Could you please throw light on similar methods along with outlier detection in python also? HI, I tried combine<-pool(as.mira(fit)) and got this message: Error in pool(as.mira(fit)) : Object has no coef() method. Error in pool(as.mira(fit)) : Object has no coef() method. I got the same error. But instead of iris.mis, I used data = imputed_data. If the input of with() is not mids object, it is invoking base with() function. Please clarify if I am doing anything wrong. Yes i am also getting same error, pls help me out of this. I got the same error, but when I modified my code as below. It works for me. You just need to modify the inputed data and model. Do you have any idea to impute all my data frame? Does all the variables of this data set has missing values ? That shouldn’t be the case because when a data set has missing values in all columns, the imputed values are highly biased. Hence, I would suggest you to subset the missing columns and then use aregImpute formula. It should work then. I separeted my dataframe in two, the firstone with columns with nulls values and the second with not nulls values in the columns. dataframe$imputed$Ultimosmovimientos[,1], I only can see the imputed values but not all mi columns values. Maybe that’s no a problem with only one column, I think I could merge the values manually, but I have about 50 columns, so my quiestion is, Do you have and advice to “merge” the imputed values with the values that weren’t being imputed. Excellent ariticle! I have been imputing missing values for various projects. And I always used imputation based on some logic. However when you mentioned that we can measure the error in imputation, It made me think how can we check the error. Principally, the training data itself has missing values and we are trying to fill up the data using appropriate logic to predict what’s the best possible value. We would never know if the prediction is correct. But since we are measuring the accuracy of imputation, I am not sure what are we comparing the accuracy against? You are absolutely right. Missing values don’t allow us to check their accuracy (predicted). However, missForest provides us out of bag error estimate. Stekhoven and Buhlmann  showed that this estimate produces an appropriate representation of the true imputation error. Least is desirable. Alternatively, you can use a long method too. Make different models by using multiple techniques (missForest, Hmisc, mean, median)for missing values imputation. I did it one day. I made 4 different models and found Hmisc performed better & faster. You are said another one valuable information,about the reports was really very great.After refer that post i get new more information,thanks for your valuable support to share that post. I didn’t apply all methods before as you describe above. It’s new for me. In my case, i am facing a issue related imputation in my data set. I have more than 150 predictor variables and observation near 15000. In data set, half of predictor variables show completed cases (no missing case) where as second half predictor variables show 97% missing cases. Can you recommend which method is good for imputation in this condition? can you please help me with getting “iris” data set used in above example…. I am using kNN method with K value 6 for NA values imputation. Is this method powerful for imputing missing data in both categorical and continuous variables. Very interesting article, much thanks. In this case, since you created the missing values in the IRIS dataset yourself, “ground truth” is available. And thus you could show exactly how accurate each of the various methods’ imputations were. Doesn’t mean those same results would necessarily extrapolate to other datasets, especially ones with more complicated data, but it’d be fun to see ! I am using mice() function in R but it keeps running out of memory. I use 64 bit R, windows 7 and 8 Gb ram. The data has about 70K obs. of 12 variables. What should I do? R stores everything is RAM and your file size seems to exceed its max capacity. I’m Working on a retail project , I need missing value imputation code in R.
Manufacture > Sub Category > Brand > Sub Brand> Units.. So Here I need to impute the missing values by Manufacture > Sub Category > Brand > Sub Brand wise. or if it’s time series data the imputeTS package. It has all of data types. I use Hmisc package to handle missing values. could not obtain 3 interior knots with default algorithm. 3 knots requested with 3 unique values of x. knots set to 1 interior values. Very Valuable Information thanks for sharing. As always fantastic article. Your work is always top notch. Probably a silly question but after I run my aregImpute model how do I get a nice dataframe with all of my imputed values out of it? Do I just take the vector out and stitch it together in a new dataframe? With the above methods, how do you impute for data sets that you want to predict on? For example, if I take a simple imputation method like mean imputation (just using mean of non-missing values), I would put the mean value in my training data set and train my model. When I want to use my model to predict, I’d get the predict data set, replace the missing values with the mean value (that I derived from the training set) and run my model. So I’m doing the same imputation for train and predict data sets. With the above methods (I’ve only tried missForest), I can’t see how you apply the exact same imputation to train and predict data sets. Running imputation on just the predict data set wouldn’t apply the same imputation as it did on the train data set (you could just have one row to predict). Hi, Manish. A very well put article. I have a doubt related to missing data values. Please throw some light, if you may. What is the best way to deal with an attribute missing 30%(say) data? I think these packages are useful only to some extent. Also, with a lot of missing data the time of execution of these imputations also reach to a very high magnitude. Is there a way to cater all of these problems? What approach is best imputation of missing values ,for highly correlated data such as gene , Microarrys ? In MICE, I try to pool fit model and I encountered the following error message. When I define fit, I used ‘ data=completeData and everything else is the same. This issue seems to exist as discussed in the link, https://stat.ethz.ch/pipermail/r-help/2007-May/132180.html. Thanks Manish for the article, it is really helpful. I applied the hmisc function but I expected a new dataset with the missing values imputed (the easy one :)) Is there any way I can do this with R effortlessly or am I missing something. Greetings Manish, Thanks for the helpful post. Is there an imputation method in R where I could use a Wiener Process? I’ve been using missForest for a while now, and I’m very happy with it. I can build solid predictions that would be simply impossible if I had to throw out each row with a missing value (I’m actually still baffled by the increase in general accuracy that can come from very sparsely populated variables). I bumped into a limitation of missForest, though: it doesn’t seem possible to *save* the filling algorithm it produces and simply apply it on a different set (of course having identical columns). It’s a bummer for me, because it means that whenever I get new data (of the same sort), I need to train a new missForest model on it, instead of just applying the old one. So my question: does any of the other models allow to save the filling criteria trained on a dataset, and apply *the same* to a new one, without learning how to fill from the new data? How would can you use mice to apply the same method for imputing missing data in the test set as you used in your training set. ?